How to fix “Reset this PC” when opting for “Remove everything” issue in Windows 10? Home »	Fix » How to fix “Reset this PC” when opting for “Remove everything” issue in Windows 10? Issue: How to fix “Reset this PC” when opting for “Remove everything” issue in Windows 10? I tried to perform the full reset of the system, but somehow this function does not fully work. During the reset, a message pops up stating that some files could not be removed. How do I fix this issue? Windows 10 offers two convenient versions resetting your system. You can either keep the files or remove everything. These features are highly beneficial, however, some users, who have Windows 10 with 1607 update installed, report that they are unable to perform this function. There might be several explanations for this matter. 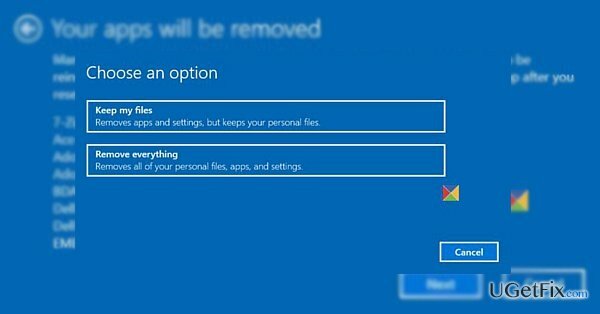 Most likely, you cannot complete “Reset this PC” with the option of “remove everything” process due to the installed Get Office application. This error is caused by internal bugs in the system. Luckily, they have already taken this matter, and this issue should be solved shortly. In the meantime, you can opt for the alternative solution. 1. Click Start and type Get Office. 2. Right-click on it and then choose Uninstall. 1. Click on the Start icon and type Powershell. Right-click on it and choose Run as administrator. 2. Type Get-AppxPackage -Name *MicrosoftOfficeHub* | Remove-AppxPackage and click Enter. This option eliminates this application permanently. If you need it, you can, later on, install it from the Google Store. It does not require much of your intervention, install Reimage and run the scan. Such tool is beneficial when dealing with more complex virtual threats. regularly update for it to function properly and maintain proper security of the system.